Because periodic droughts will always be a part of life in California, the UC California Institute for Water Resources (CIWR) produced a series of videos to maintain drought awareness and planning, even in years when water is more abundant. The final video of the three-part series, which focuses on drought strategies for citrus, was launched April 6 on the UCTV Sustainable California channel. The first episode, which centered on alfalfa production, premiered Feb. 2 on the UCTV Sustainable California channel. The second video, on almonds, was launched March 2 on Sustainable California. A trailer with clips from all three episodes is here. The videos are inspired by a collection of 19 drought tips produced by CIWR in collaboration with UC Agriculture and Natural Resources researchers during the drought of 2010-16. The tips cover a broad spectrum of California crops, from alfalfa to walnuts. Topics also include salt management, use of graywater in urban landscapes, and the use of shallow groundwater for crop production. 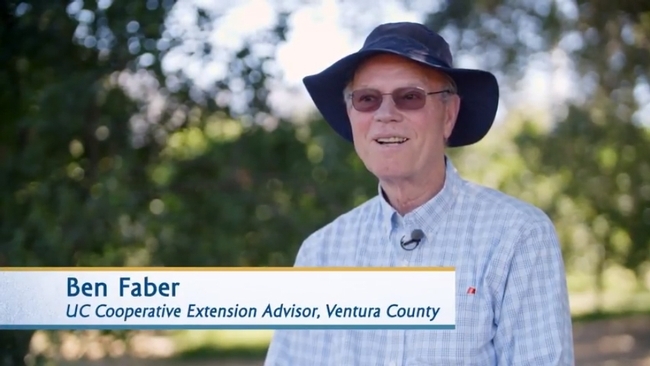 UCCE advisor Ben Faber is featured in the CIWR video on drought strategies in California mandarin production. For a complete list of drought tips, see http://ucanr.edu/drought-tips.